Metta "Mets" Francis is a multi award-wining London based professional nail technician/nail artist and the owner of Nails by Mets. HC: Hi Metta, how did you get where you are today? Can you summarise for us your career in the industry? M: Before becoming “Nails By Mets”, I was an IT consultant for many years - it was my first graduate job. I always wanted to start my own business in something that I really enjoyed and something that would be really flexible for my future family and myself. I was already really interested in nail care and nail art. I decided to train in my passion along side my job. I started to take on private mobile clients evenings and weekends – basically when I was not working. this service as a mobile nail technician in London. the Mark Fast x Jonathan Aston collection launch. It made me realise that “Nails By Mets” could be a lot bigger than what I thought. In between, I got pregnant and during my maternity leave I realised my current job could not give me as much as flexibility as I wanted. My heart wasn’t in it either. 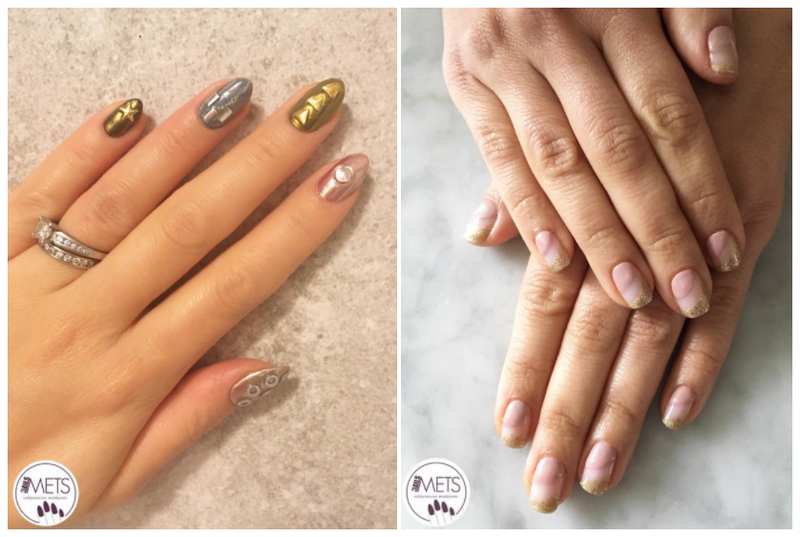 Since being in the industry, Nails by Mets has been the chosen nail supplier for a number of fun events and brands including Ted Baker, The Disney Channel, MTV, Barry M, Gigi Hadid X Reebok Classic launch at JD Sports, Little Ondine for Stylist Live. As a session nail tech, I’ve had the opportunity of leading shows at London Fashion Week and this month I’m heading to Paris with Marian Newman and her amazing team. HC: What made you choose Hunter Collective as your new base? M: I love the space at Hunter Collective! As I am mobile I very much go to my client’s home, offices, hotels etc but every so often there will be somebody who may live a little too far, or for whatever reason, I can’t visit them. It gives me the option of having clients travel to me. So I chose Hunter Collective because it is just amazing. It is bright, airy, a really nice aesthetically pleasing space. If I was to have a salon it would be the sort of thing that I would want. A really clean and warm feeling, it’s great to meet other creative professionals using the space, like hair stylists and make up artists. Another benefit that I love here is that if I want to come for a whole day, I can set up my own nail desk as I wish with my products and can do my admin/business work in the hot desks area. I’m not running around London from client to client and I can potentially fit more clients into 1 day. HC: What does it bring to your business? M: Privacy. It's a convenient location but still tucked away and private - it feels intimate and I still have the ability to give a special, personalized service in a lovely space - which is surprising as it is a Central London Location and 5 minutes walk from Farringdon Station. HC: What do you love about freelancing? M: I love having complete freedom - I can choose whichever jobs I want to do – I like to feel free in what I do and I can manage my own schedule. accordingly. It works around my personal and home life, and that’s a big priority for me. HC: What tips would you give to a Nail technician who is thinking about going freelancing? M: Make sure that you have great brand awareness, an effective website and a strong social media presence. This is essential and these are the things that potential clients will be looking. Also, If you are quiet use that time to network! Put yourself out there, invest in further training or go to events. Try to collaborate with with other creatives – arrange a shoot or skills swap! If you are interested in nail art, use that time to practice your art. I plan to do a lot more of this in 2018 – it’ll keep me creative and, give me more online content! Another thing is to not sit back and think things will just come to you – as a freelancer to have to constantly hustle and be proactive. Speak to people, make new leads and put the hard work in. Ask other professionals for advice but also be mindful of what you’re asking them for. They would have spent years cultivating professional relationships and honing their skills so ask yourself whether with a bit of your own research and hard work, you could find the answer to your question. Don’t be lazy! newsletters (Doug Schoon’s is great for technical knowledge) and follow the relevant industry accounts on social media! Thank you so much Metta!